At least 20 days before the performance. The minimum number is 6 dancers and 3 musicians. 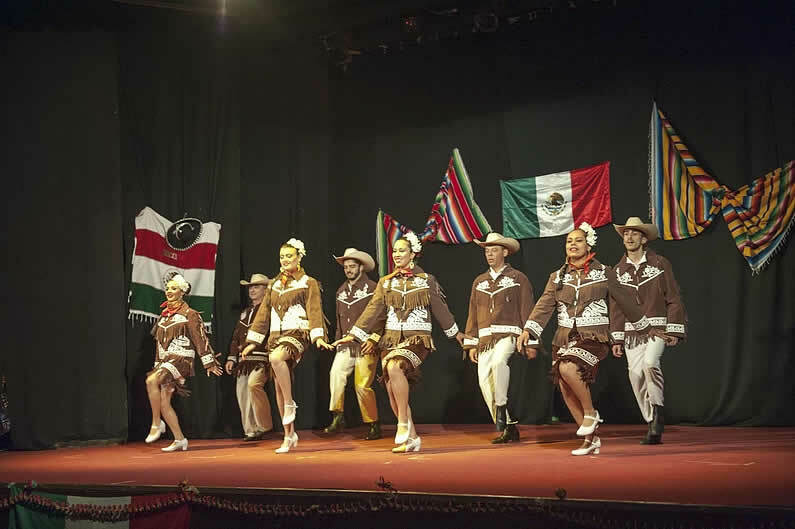 The maximum is 20 dancers and 6 musicians, an overall assistant and the President. The show may last from a minimum of 30 minutes to a maximum of 2 hours. The musical ensemble accompanies the dances and may also perform during the intervals. If no musicians are foreseen in the show, the dancers may dance to CDs (specially masterized for the occasion). Wooden or sound-board stage measuring 7x7 meters as a minimum, completely free from any material. The performance cannot take place on carpeting, marble or cement floors. Changing room with measurements proportional to the number of elements participating in the performance. This should be at least 20 meters away from the stage. The changing room should have mirrors and bars to hang the costumes. Sound equipment capable of playing masterized CDs including loud speakers. 8 to 12 microphones on poles and 1 without, in case the musical ensemble is to participate in the show. To request our show, fill out the form online!